When I started looking for hotels in New Orleans, I started looking, like most people do, in the French Quarter. I stayed in the French Quarter a couple of years ago and it made everything so convenient. This year, I wanted something different. 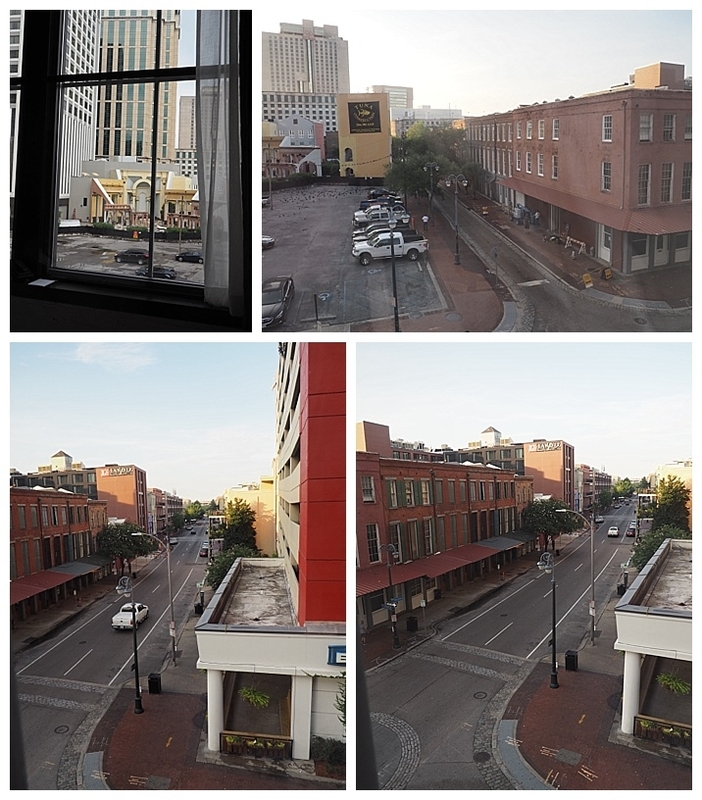 Amanda had visited in New Orleans last summer, so with both of us knowing that there were only a few things we wanted to do in the Quarter, I started looking for hotels elsewhere. I had couple of requirements, while not in the Quarter, it needed to be within walking distance of the Quarter and it had to be something different than a traditional hotel. Enter The Old No. 77 Hotel and Chandlery on Tchoupitoulas Street in the Warehouse District/Central Business District of New Orleans. Confession time. 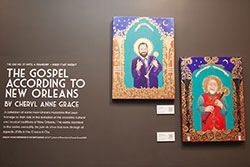 I was talking to my friend Chip at Oceans and Lands Travel about this hotel and he highly recommended it, and said that he wanted to stay there the next time he got to New Orleans. It also houses Compere Lapin, the restaurant of Chef Nina Compton , one of my favorite chefs from Top Chef. (More on our dinner there, later) We talked for a bit then I went ahead and booked it. Like an idiot, I forgot to let my bestie travel agent BOOK MY HOTEL. While all’s well that ends well, I feel guilty that I didn’t let him get the booking. So a piece of advice. When your bestie is a travel agent, let him book the hotel even if it is only for two days! A communal table overlooking exposed brick wall. The second part of the hotel’s name is Chandlery. What the heck is a Chandlery? Well, a chandlery is a warehouse where goods are sold. As this building’s history is that of a warehouse, the Old No. 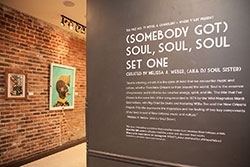 77 has sells goods made and produced from local artists and entrepreneurs. We wanted to take one of everything home with us, but we refrained. 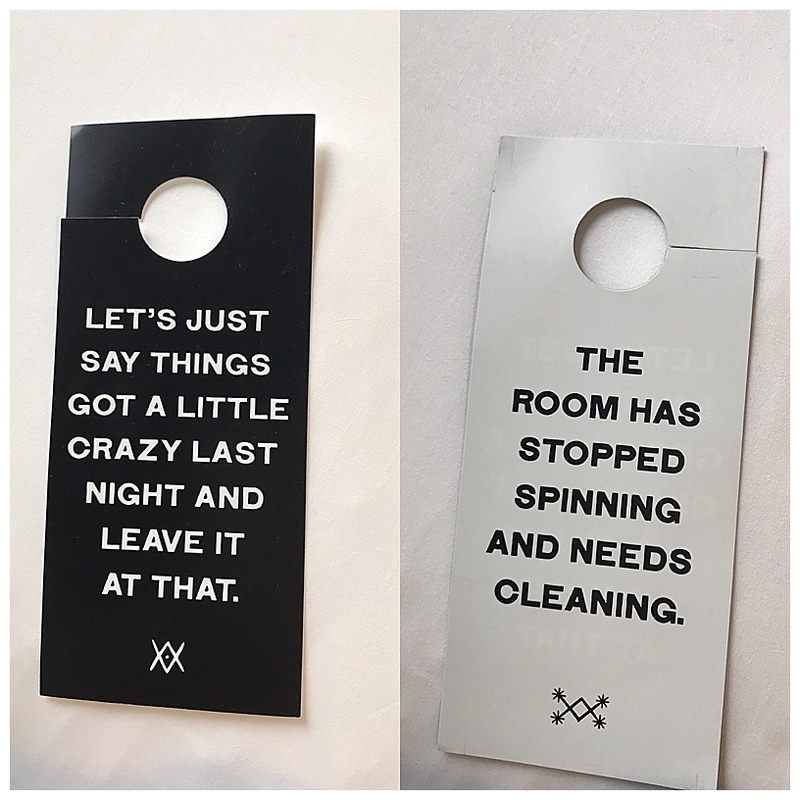 I really loved seeing a hotel support locally produced goods. It also honors the history of the building. I originally booked a king room with Lagniappe, meaning, my rate included parking and a credit to their lobby coffee bar. When we checked in, they asked if I would rather have a room with two queen beds instead. Yes please! Upgrade time! Our room was awesome. We were in the Lafayette section, on the third floor in a corner room. Pretend I have photos because yeah, photographer fail! I forgot to take photos because we were so tired that we both collapsed and made a mess of the room. You’ll have to enjoy these photos provided in their press kit and pretend that I took them. We had HUGE windows that looked toward the river then the down Tchoupitoulas. Below are some examples of their rooms. I did take a couple of photos of the view, which was lovely. 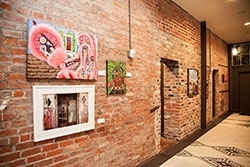 As part of their commitment to embrace local culture, the Old 77 displays and sells local artist’s works throughout the hotel and host an Artist in Residence every July. 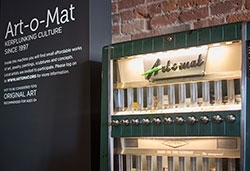 I’ll have more information on the Art-o-mat in a later post. 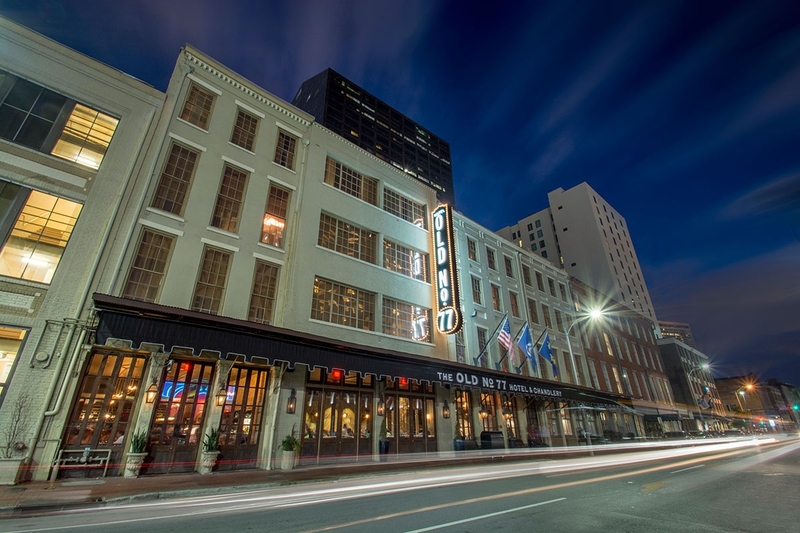 While we were in New Orleans, Travel and Leisure Magazine named The Old No 77 Hotel and Chandlery to their list of the Top 15 City Hotels in America, coming in at number thirteen. Overall our stay was great and I will stay there again–this time remembering to book through Chip! The only issue that we had was that the room wasn’t as cold as I like, but I like my hotel rooms to be arctic temperatures, (not like a normal person) but giving that our room has massive windows on two sides,faced east, it was July in New Orleans and temperatures reached into the mid 90s every day, I’m not surprised that the air conditioning had trouble keeping up. One last thing, I wasn’t paid to stay here or asked to write a review, so these are my own thoughts and opinions. 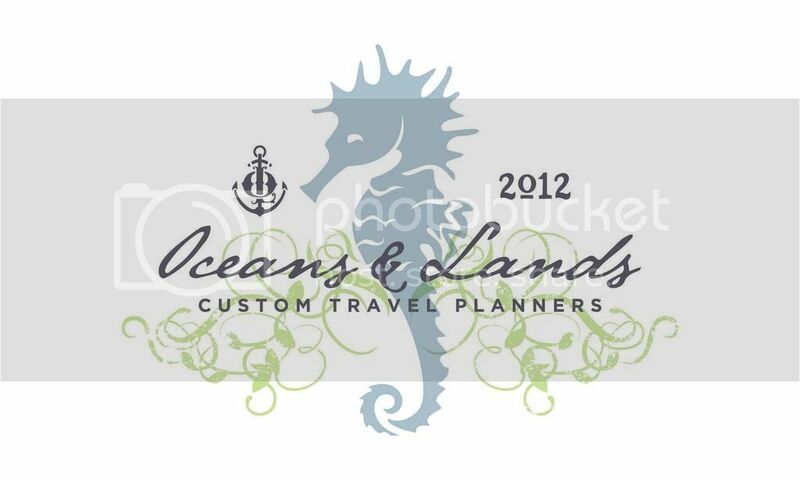 For more in depth information, please click on the links, and if you are looking for a fabulous travel planner who LOVES to do custom planning, click on Oceans and Lands Travel Planners. 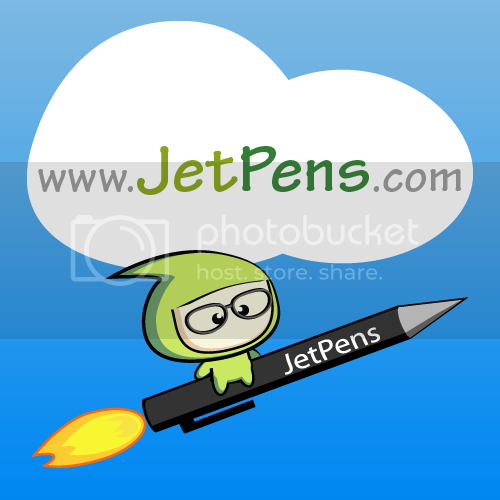 There is also a link in the sidebar. Next up, Part 3, our one full day in New Orleans…we go to a zoo. Literally. Awesome! I love local hotels and particularly ones that promote other local businesses/artists.